It was hump day on our Cornwall family holiday. We were all tired, including a grumpy Noah, the weather was drizzly and miserable. So far, we’d enjoyed very full and active days exploring the likes of the Eden Project and Bodmin Jail. 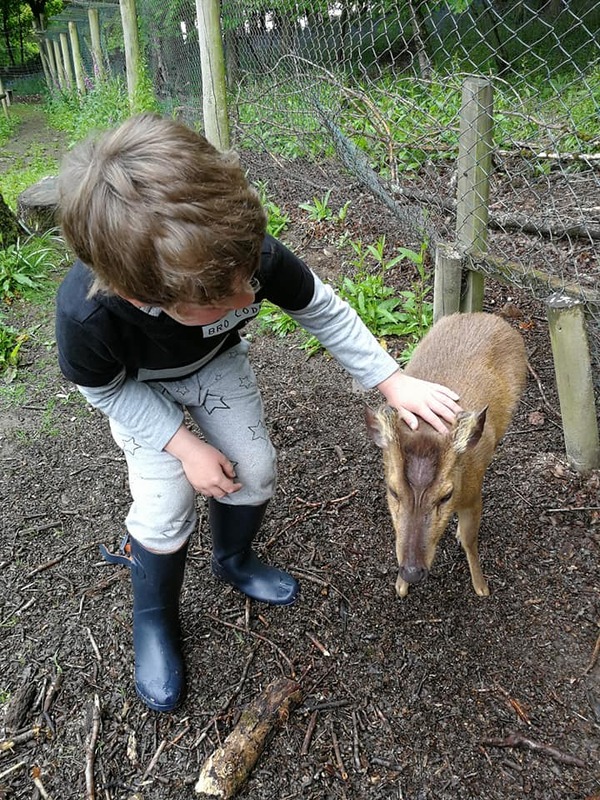 We decided it was time for a more chilled out venture close to our home for a week, a converted barn near Tintagel, so we pulled on our wellies and headed to the charming Tamar Otter and Wildlife Centre. 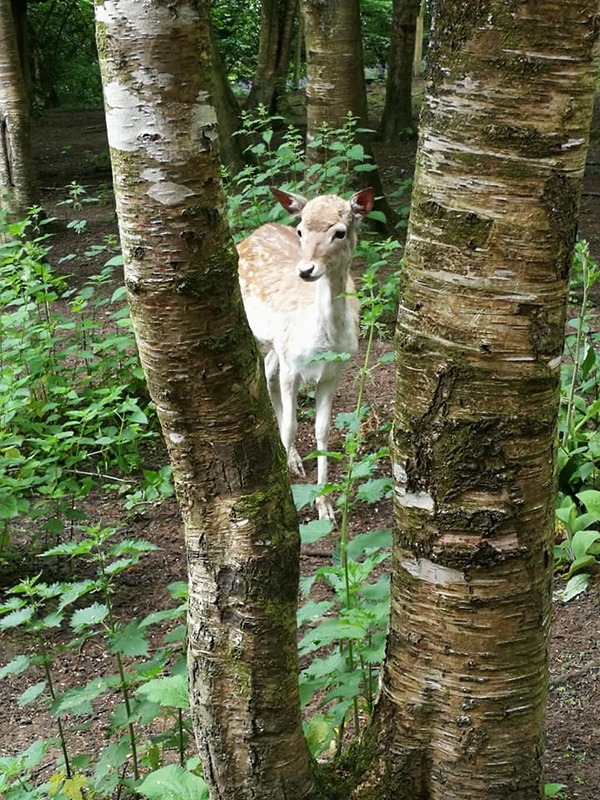 When we arrived we were told to stick to the main paths as the site is home to baby deer, whom could be rejected by their parents if we were to approach them. The whole sanctuary has an open plan feel to it, with many of the animals being allowed or having the choice to roam around freely, so there could be the real risk of stumbling upon a fawn unintentionally. A bird of prey talk was just starting. The centre have different types of owls and raptors including a beautiful Eagle owl. Later on, when the crowds had dissipated, Noah had the opportunity to handle a kestrel. Feeding time for the British otters. Feeding time for the otters is combined with a tour where we were introduced to the playful Asian short claw otters and the slightly more grumpy British otters, all of which seemed to have their own quirks and characteristics. We found out that otters live in a matriarchal society where females are in charge. This meant that unusually, three particularly vocal young male siblings had to be kept separate from the others as they were not quite ready for a female to be introduced to their group. It was interesting to see, like most brothers, they had their little squabbles too! We also learned that otters mate for life. So the largest group of otters we saw were a female and male and their litter, who seemed completely unfazed by all the visitors and appeared to “pose” for the cameras (we guessed they had probably just realised it was lunch time and so were waiting eagerly to be fed). Asian Short Clawed Otters at the Tamar Otter and Wildlife Centre. Milling around was a puffed up male peacock, a bunny, chickens and a three-legged deer named Dasher who approached Noah for attention. Dasher likes attention from his visitors. Cutting our time with the larger British otters a little short, we decided to head to the quaint little tea room before the crowds got there. We were lucky enough to find a table inside but there were also an overflow of tables outside in an undercover area. I opted for a cheese and onion pasty and a bowl of homemade butternut squash sweet potato soup. It really hit the spot. While Noah enjoyed sausage roll and baked beans. We really liked that you could see the kitchen area, so you could see that the food was freshly prepared. Deer are free to roam the woodland. Past the otters, through a gate, was the entrance to the woodland walk where you can spot all sorts of wildlife but the highlight was carefully approaching the herd of deer to offer food, something Noah, who is full of energy and rather heavy handed, struggled with at first. Later Noah was amazed that one of the more confident deer went right up to him and licked his hand; he described this experience as “really wet and sticky and gooey”. 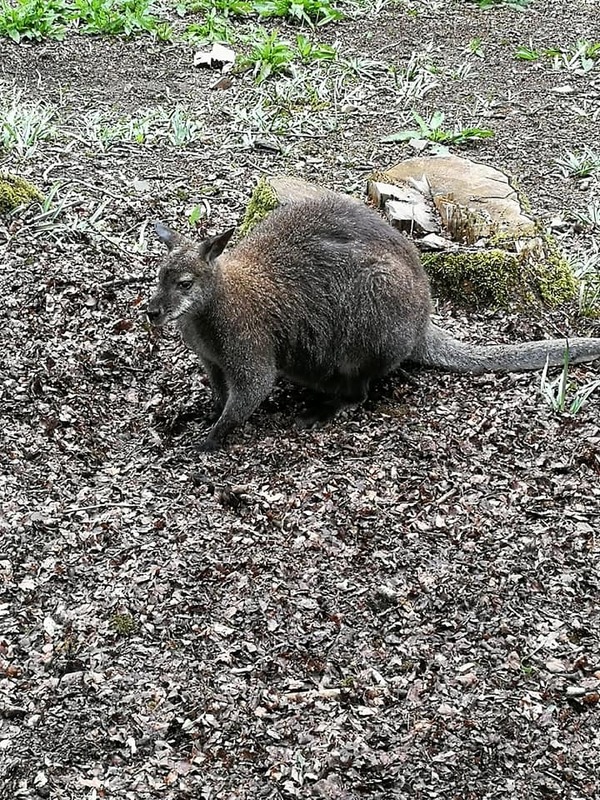 There are plenty of wallabies to see! Wallabies stared curiously at us from among the foliage as we ventured further into the woods. Some hopped across our path and some had babies with them which was wonderful to see. We reached the meerkat enclosure where it was sad to learn that one of the meerkats, a few weeks earlier, had burrowed deep down into the ground and disappeared, leaving her mate all alone. Despite investigation, it’s unknown what has happened to the female and the male now spends his days guarding the territory and looking out for her. Circling around, we headed back towards the tea rooms, crossing the paths of more wallabies and a magnificent white peacock who, thanks to a rogue bunny, gave us a spectacular display of his feathers. 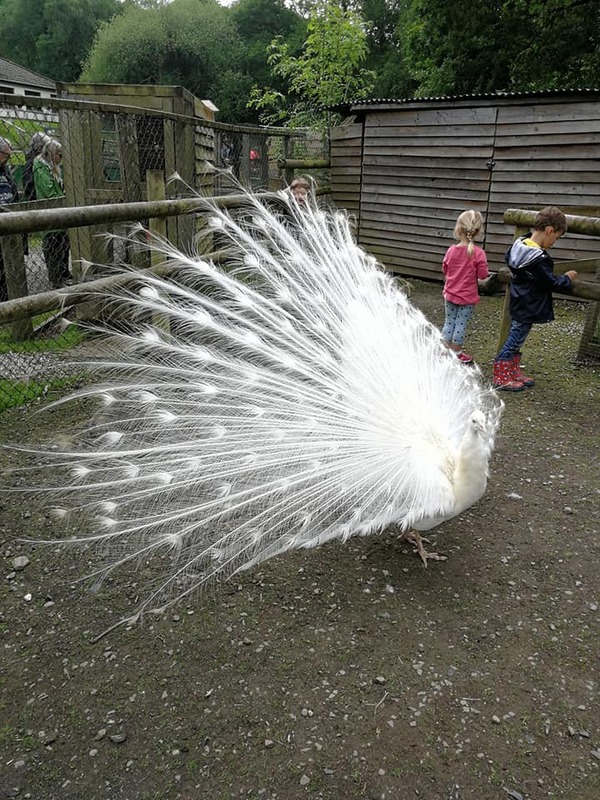 Beautiful white peacock shows us his feathers. After pausing for a moment to take in more views of the deer and saying goodbye to the adorable otters, we closed the day by sampling the tea room’s homemade cakes and, of course, a visit to the gift shop which was full of lovely unique items that would be perfect as gifts. Tamar Otter and Wildlife Centre is entirely funded by visitor admissions, sales from the tea shop and gift shop. The animals looks really healthy and the staff are enthusiastic about their care and rehabilitation. It’s so important to support centres like these because different species of otters are endangered or vulnerable due to being hunted for fur, water pollution and destruction of habitat. In some countries, they are even taken as pets! Exposing children to these wonderful creatures and the other animals at the centre is also a great way to teach patience, care and to raise awareness of the importance to protect them now and in the future. 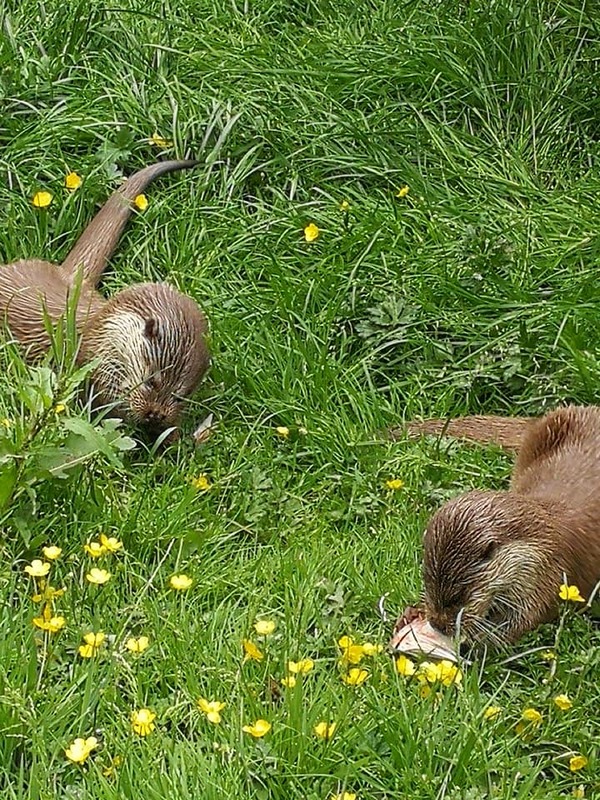 Tamar Otter and Wildlife Centre is located at North Petherwin, Launceston PL15 8GW. Details of opening times and prices can be found at their website.